It’s always nice to see a sub-editor receiving praise. 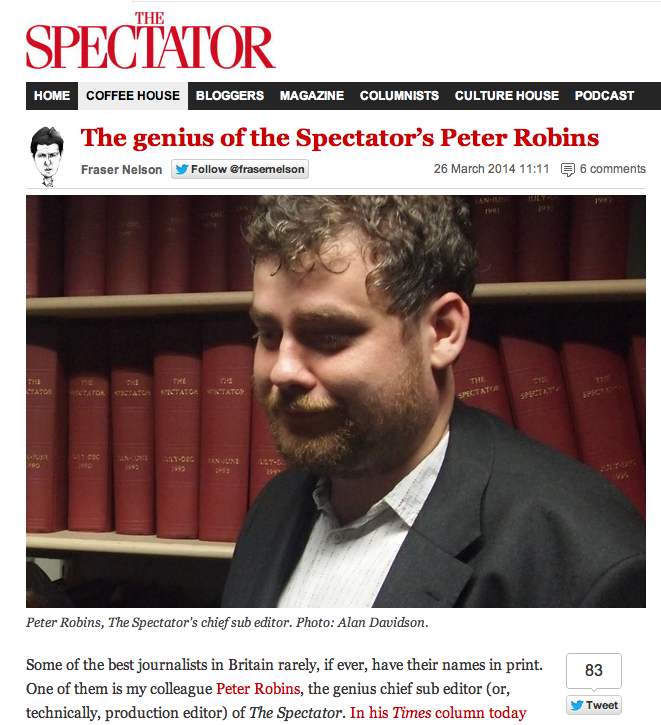 It’s even nicer when it’s someone you know: Peter Robins, former hero of the Tribune’s Saturday news shift and media desk, now amiable primus inter pares at possibly the only magazine in Britain that would still require someone with his talent for Latin. He once helpfully volunteered to read a page of the business section while waiting for some home news to sub, and noticed that the axis labels on a small downpage graph had been transposed before most people would have got to the end of the standfirst. He is, like all the best editors, as unafraid of statistics as he is of the ablative case, and has the diplomacy to put things right without putting writers’ backs up. Journalism is a space-limited medium as well as a time-limited one. There’s never enough time to get on top of the whole story, and then never enough space to write down what you found out anyway. Every minute and every word counts. You understand a writer’s desire to prepare the ground for readers. In a longer story, there’s also sometimes a need to put the key phrase in the opening par and then repeat the whole quote, for context, later on. And you grasp that journalism’s modus operandi is to expound and then support – to announce the news, then the quotes to back it up. Most of the time, you can just delete the whole introductory clause: the quote is usually clear enough on its own. 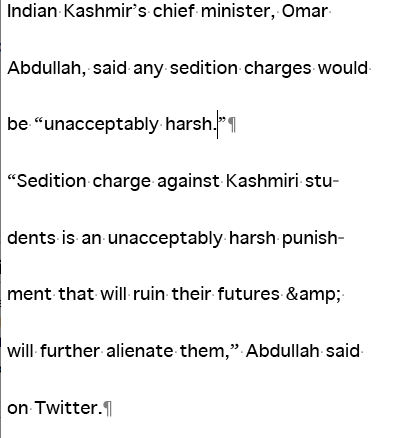 That solution certainly works well here: just go straight from “… chief minister, Omar Abdullah, said…” to “Sedition charge…”. On occasion – say when an opaque piece of diplomatic-speak needs to be translated for a lay audience – a preliminary paraphrasing may be helpful. But there is never, ever a need to run an identical phrase in two consecutive sentences of a news story. As HeadsUp has been at pains to point out for many years, “an inch less foam is an inch more beer”. There but for the grace of God, of course. And I’m sure I won’t get to the end of my own career without perpetrating a few more howlers. 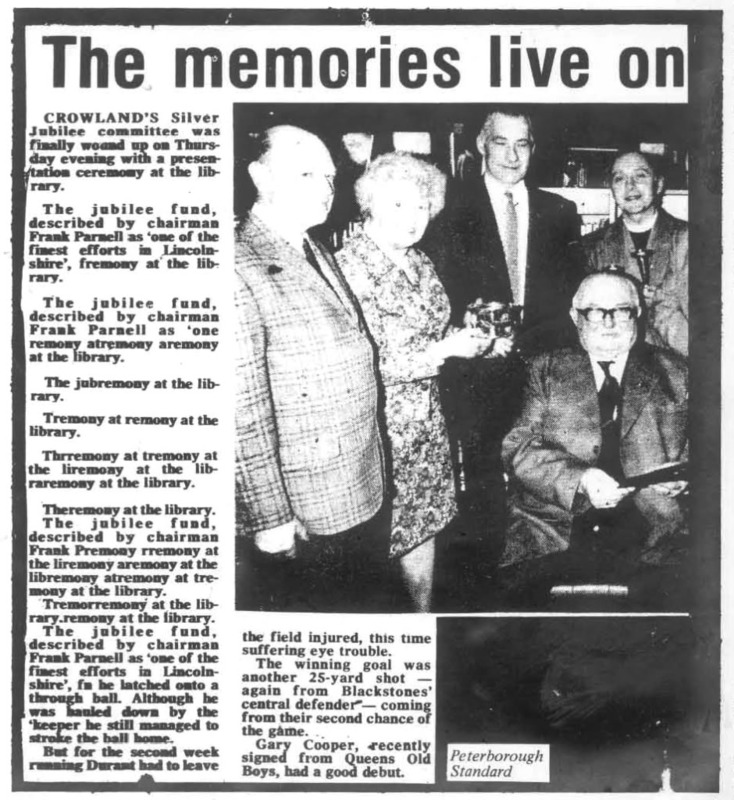 But this – from the Peterborough Standard in 1979, via Private Eye and ultimately via the Brave New Malden blog – is … wow. It was passed round the newsroom for amusement, but actually provoked something closer to awe. The unexpected appearance of the perfectly subbed match report halfway through is joyous. And, as the Tribune’s chief revise sub observed, not the least remarkable of many remarkable things is the fact that it fits. Which only leaves the question: how? It’s almost impossible to believe that this could have happened in hot metal, or even photosetting. But 1979 is pioneeringly early for any kind of electronic pre-press system. Can anyone shed any light? Was anyone out in the field in the late Seventies and working on a system that could have produced a result like this? A few months ago, we discussed how the cast of thousands that populates the Daily Mail’s UK website was quietly expanding to include US stars with little or no profile in Britain (and vice versa in the US) as DMGT expanded in America. Now, both the Guardian and the Mail are opening up a third front, in Australia – and another group of new faces are starting to find their way to a bigger audience. Ms Bingle is fairly well known in Australia, it appears, as a reality star and model. But this teaser is taken from the British homepage, and offers no explanation to the northern hemisphere as to who she might be. Elsewhere on both the US and UK sidebars, there’s what I imagine might be the Mail’s first ever story on the Sydney Mardi Gras, as viewed through the filmy prism of Sophie Monk’s corset – although this time it is explained that she is an “Australian model and radio personality”. When this first started happening, there seemed to be two possibilities. One was that it was by mistake – that the pressure of keeping two busy country front pages up to date meant that things were getting put in the wrong place. But as those little who’s-who explainers beneath the headlines start to become more frequent, the other explanation seems more likely: that this is deliberate. Their appeal so far has been entirely domestic; certainly in Sam’s case, readers in Wisconsin are going to have to guess at how much weight she might have lost, as this is likely to be the first picture they’ve ever seen of her. But the point is clear: this is an introduction. This is a debut. Rather than sit in the silos of their home markets, every anglophone celebrity on the Mail’s radar, from Billericay to Cronulla, is about to go global.